Why is Pool Filter Maintenance Important? Do you have filthy pool water? Have you tried cleaning your pool filter media time and time again to no avail? Are you searching for the perfect way to keep your swimming pool clean, clear, and safe for you and your family to use all summer (or all year) long? If you find yourself looking for options when it comes to cleaning up your pool water, we’ve got you covered. In this article, you’ll learn a little bit about cleaning your pool filter and why it’s so important. You’ll also find out what you need to know and what items you might need to perform regular filter cleaning. In the second half of the article, you’ll find product reviews for 7 of the best pool filter cartridge cleaning solution options as well as filter cleaning tools to help you get the job done. You’ll be able to choose which one will work best for you and your pool, and you can determine whether or not you need to pick up a tool as well as a solution to help clean your pool water. Choosing the right way to clean your pool can be challenging, but with our advice, it doesn’t have to be. Read on to find out more about how to choose the right products for cleaning your pool, how to perform regular filter maintenance, and of course, why all this is so important. Last update on 2019-04-21 at 09:25 Product prices and availability are accurate as of the date/time indicated and are subject to change. Any price and availability information displayed on [relevant Amazon Site(s), as applicable] at the time of purchase will apply to the purchase of this product. Last update on 2018-06-19 at 06:26 Product prices and availability are accurate as of the date/time indicated and are subject to change. Any price and availability information displayed on [relevant Amazon Site(s), as applicable] at the time of purchase will apply to the purchase of this product. There are a lot of great reasons you should focus on cleaning and maintaining your pool filter. If you’re a little unsure on what these reasons are, check out our list below. Keep you and your family safe. First and foremost, regular pool filter cleaning can help you reduce the risk of waterborne illnesses and parasites in your swimming pool. Even pool water treated with chemicals can’t remove all contaminants, so with a regular cleaning cycle, you can improve the health of your water. Keep your pool looking beautiful. Clean water makes your pool look aesthetically much more pleasing. This is great for you as well as any guests who might want to use it! Keep your pool running safely and correctly. Many pools won’t operate at all with a dirty filter in place, but even if yours will, you won’t be running it correctly. It can be unsafe and may cause damage to your filter or pool pipes if you keep operating it without cleaning it regularly. Keep your pool operating under the law. Some areas require a certain amount of filtration by law. If you let your filter get very dirty, you’ll be breaking the law—whether you mean to or not. This law is usually in place to protect people from waterborne illnesses, so do yourself and your neighbors a favor by keeping your water filtered. While it’s entirely possible to call a licensed pool technician to take care of your filter cleaning and regular pool maintenance, there are plenty of reasons why you might want to do this yourself instead. Remember, however, that if you have any concerns about being able to properly perform the tasks required for your filter maintenance, you should always call an experienced tech rather than risking harm to yourself or your swimming pool. You can save money on calling a pool tech. Pool cleaning techs can be very expensive, and it can be a big strain on your budget to have to call them every time your water gets dirty. Cut back on costs significantly by doing it yourself. Reduce the hassle of scheduling an appointment. You don’t have to rely on someone else’s schedule when you clean your own pool filter. As soon as the water gets dirty, just clean it yourself, and you’ll be able to use your pool again in no time. Save money on the cost of extra pool filters. You can easily extend the life of your filter significantly when you clean it yourself. You don’t have to replace it every time it starts to get a little bit dirty, and you can usually get at least a year of life out of each individual filter—and sometimes much more. Learn how to do some work on your own pool. It’s always a good idea to have some working knowledge of how your swimming pool functions. When you regularly clean and replace your filter on your own, you’ll be able to learn a little bit about how your filter and pool work, and you’ll be better able to fix small problems that might arise over time, too. You’ll need a few tools to help you keep your pool filter clean. None of these are too specialized, but be sure you have them on hand before you try cleaning your filter yourself. Wrench – You’ll need this in some instances to either turn off the water to your pool and filter or remove nuts and bolts to help access the filter housing unit. Screwdrivers – Make sure you have both a Phillips head and a flathead screwdriver handy so you’ll be ready for whichever type of screw you encounter in your filter. Bucket or another container – You’ll need this if you plan to soak your filter media. Be sure you choose a bucket large enough, like a pickle tub. Filter cleaner – This is a solution you’ll use to soak your cleaner either for a few hours or overnight. You might choose from a lot of different options for this. Filter sprayer – These tools are great for getting between the pleats in cartridge filters. You can also use your garden hose in some cases. Aside from tools, there are a few things you’ll need to know in order to properly and safely clean your pool filter. Check out this list to be sure you’re well aware of everything that needs to be done to clean your filter the right way every time. Turning off your water. You’ll need to know how to shut off the water to your swimming pool and filter before you get started. Shutting off power to the filter. It’s much safer to do any work on your pool or filter by shutting off the power first. This should be as simple as flipping a breaker or removing a fuse. Handling normal tools. You don’t need to use power tools for this job, but you will need to know how to use a few tools, such as a wrench. Choosing the right pool filter cleaner solution can be a little difficult, but it really all comes down to what type of filter you have. If your filter media is made of paper or thin fabric, you’ll need to be a little choosier about the types of chemicals you use for your cleaning soak so you don’t run the risk of eating away at the filter paper over time. On the other hand, if you have a sand filter, you can’t use regular cartridge filter cleaners for it, so you’ll need to select a filter designed for sand use only. While this might sound like a lot to wrap your head around, once you determine the types of cleaner you’re looking for, you can easily narrow down your selection. 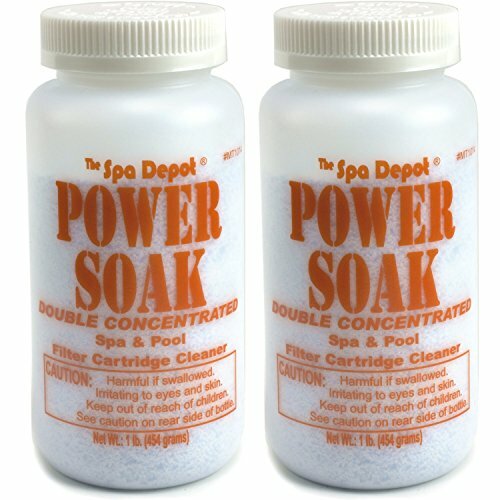 The 2-Pack Power Soak Spa & Pool Filter Cartridge Cleaner is a great swimming pool filter cleaner for any traditional pool filter cartridges that might be a little more gunky than you’d like. They are designed to work with pleated paper, fabric, or fiberglass filters, but take note that they don’t work with pleated ceramic filters. This cleaner comes in a powder form that you can add easily and quickly to the water you use to clean your pool filter cartridge. Best of all, you don’t have to use the whole bottle at once, so a single one-pound bottle is sure to last you a long time to come. Each bottle can help you clean your filter two to three times easily. This product works great whether you choose to soak for just a few hours or leave the cartridges soaking overnight. You can use this product along with other cleaning and pool chemical treatment products. This product has been known to cause pH spikes in pool water, so you may need to use other chemical treatments to get this under control. May take a long time to clean filters that are very grimy or have a lot of hard water buildup. May weaken the material of lower-cost paper filter media over time. If you’re looking for an excellent pool filter cleaning solution that doesn’t need anything added to it, look no further than the GLB Pool & Spa Products 71010 Pool Filter Cleaner. This easy to use product can be added to your filter cleaning water or used as a soaking solution all on its own, depending on the specific needs required by your filter. You can use it even if you treat your pool water with bromine, chlorine, or ozone, and it’s safe for use with all types of pleated filter cartridges. This type of cleaner is not, however, designed for use with sand filters. Each individual bottle contains enough solution for two to three uses, which makes this a cost-effective option. Great for recycling filter cleaning water—just reserve it after one use and save it for next time, up to three uses. Removes even the most caked-on gunk and even hard water buildup from your filter cartridge. May make a lot of bubbles in some filters, especially without proper rinsing. May not be strong enough to get incredibly dirty, grimy filters clean without the use of cleaning tools as well. Could be too harsh for low-cost paper filters in some instances. Sand filter cleaner for pools poses its own sets of challenges when it comes to cleaning, but with the In the ﻿﻿Swim Liquid Sand Pool Filter Cl﻿﻿eaner, you can have beautiful, crystal clear water every time you run your pool. This easy-to-use product is designed to work in conjunction with your backwashing cycles to help improve the quality and cleanliness of your swimming pool water. It rinses your sand granules clean of any contaminants that might have built up on them, which in turn makes your filter run much more efficiently and for much longer. Stays in the sand filter for an hour before you rinse it out, which gives it plenty of time to do its job well. Great at helping to reduce the pressure in your sand filter by cleaning it up thoroughly. Perfect for keeping clumps of dirt and sand from finding their way to the bottom of your pool. Cannot be used with cartridge or diatomaceous earth filters and is only for use with sand filters. May take longer to use during your backwash cycle than some other products. 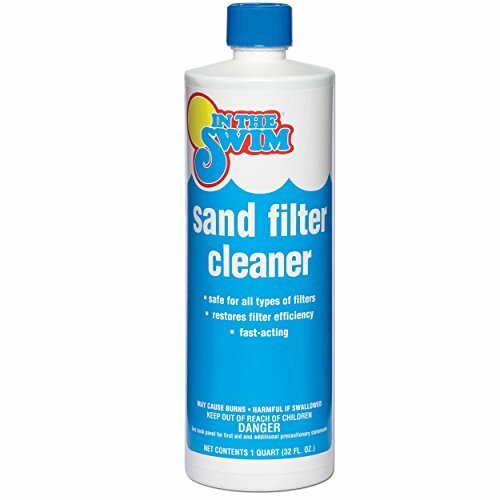 Individual bottles of this swimming pool sand filter cleaner are small and may only be good for one to two uses. When you want to clean your pool filter without the use of harsh chemicals or you just want to incorporate two steps into your cleaning process instead of just one, you need pool filter cleaning tools to help you make the most of your cleaning experience. With these tools, you can rinse your filter media much more easily and you’ll be sure to get through each and every pleat perfectly, every time you clean. For only a few dollars, you can add an important extra tool to your pool cleaning repertoire. If you find that simple rinsing and soaking of your pool filter isn’t quite getting the job done, you might need a specialized pool filter cartridge cleaner to help you clean your products that much more easily. With the Mi-Way Aquacomb Pool Filter Cartridge Spray Cleaner, you can have fresh, clean, clear pool water after every cleaning! This product sprays water from small nozzles and can be used to “comb” the pool filter at the same time, which helps loosen the sediments that have built up on the filter media. You won’t have to do any harsh scrubbing when you use this durable product on your filters. Works great whether you choose to pre-soak your filter cartridges or just rinse them without harsh chemicals. Very strong water pressure keeps your filters clean and clear. 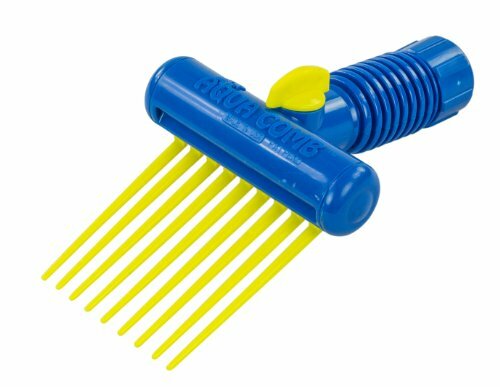 Easy-grip handle makes it comfortable for you to hold the comb as you use it to part the pleats in your filter. May get you a little bit wet while you’re using it due to the pressure of the jets. May be known to arrive cracked in some rare instances. May leak from the handle in some cases. When you have trouble reaching all the pleats of your pool filter media, try using the No products found.. “Flosser” is a great name for it, because that’s pretty much exactly what it does. This tool can be used to spray small, thin jets of water all over your pleated filter, which in turn can help loosen up caked-on sediments. It’s curved to make it easier to get to the hard-to-reach places between each individual filter pleat. This is an especially good choice when you have a tightly pleated filter that needs a lot of cleaning. Easy to use and comfortable to hold onto even for an extended period of time. Easy to keep the sprayer itself clean after many uses. 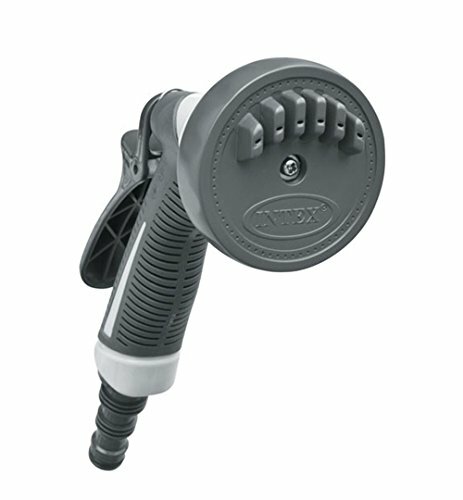 Can be turned on and off as needed without having to completely shut off the water or remove the nozzle from the hose. May be difficult to use without getting wet since it has a large spray trajectory. May take over a half hour to rinse each pool filter with this product. Water pressure has been known to be less powerful than with other, similar products. Attach the Intex Cartridge Filter Cleaner for Pools to the end of your garden hose in place of the traditional hose head, and you’ll be well on your way to cleaner, clearer, and safer pool water in no time. The nozzles included on this spray head help focus thin jets of water on the parts of your filter that need it most. Keep your pleats free and clear from built-up contamination by regularly using this filter cleaning tool to rinse them free from dirt, debris, and more. This product is easy to get the hang of, and it works great in conjunction with pool filter cleaning solutions, too. This sprayer is easy to focus on the places that need it most without wasting water on areas that are already clean. The plastic the spray nozzle is made of is durable and built to last a long time. Works well enough that you might be able to avoid harsh chemical soaks altogether. The cleaning tool doesn’t come with an o-ring to seal it to your garden hose, so it will leak if you don’t provide your own. Screws and nozzles have been known to arrive stripped and difficult to operate. May take a long time to clean your filter with this product. 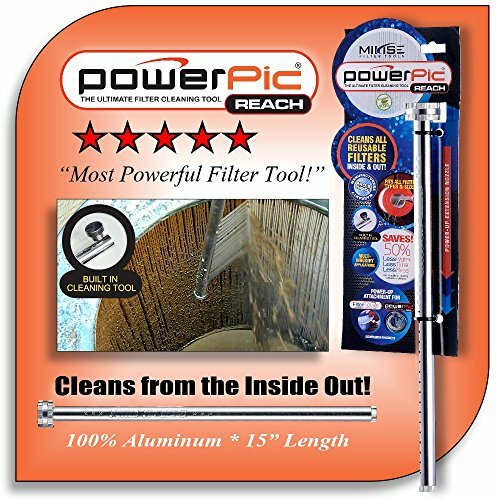 The Power Pic Reach Filter Cleaning Tool is built to do everything a spray nozzle can with none of the hassles. This very easy to use product spritzes water from a row of vertical nozzles at high pressures. You can use it to dislodge dirt and contaminants from the pleats of your filter, and you can even use it to get into tighter places in smaller filters that other, larger cleaning tools might not be able to reach. If you’re having a hard time getting the finer details of your pool filter as clean as they should be, give this product a try and you won’t be disappointed. This filter cleaner can be used on just about any type of filter made from any brand or company. The extended spray option with this cleaner covers a wide area without sacrificing strength. Despite this being a small, handheld item, it’s got a lot of power and pressure in every use. The cleaner doesn’t include an on/off valve, so you have to simply detach it when you aren’t using it instead of shutting it off. May be difficult to clean the nozzles if they happen to get clogged up. This product can potentially rust if you don’t dry it off or allow it to dry properly before storage. You’ve got a lot of options when it comes to picking the right way to clean your pool filter! Everyone needs at least one method of pool filter cleaning, and sometimes, if your filters get very dirty and grimy on a regular basis, you might need more than one. With the right combination of a pool filter cleaning tool and a filter cleaning solution to help you get the job done right, you’ll be able to clean even the most disgusting of filter media every time your pool water starts to get gross. Remember that not all types of filter cleaning solution are made the same, so your filter might require a certain type instead of another one. Sand filters, for example, need different types of cleaners than other filters, so it’s a good idea to check your filter’s manual to make sure you’re purchasing the right type of cleaner. Aside from this, however, choosing any of the products on this list will help you find the perfect way to keep your filter clean no matter what. Give any of them a try and see what makes them some of the best choices on the market today. Your pool will thank you for it!